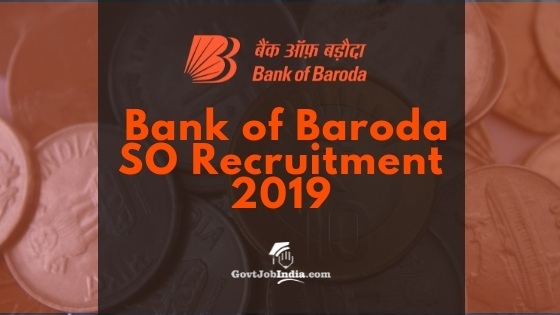 Bank of Baroda SO Recruitment 2018: The BOB So recruitment 2018 is officially underway. Bank of Baroda is presently looking to hire 913 candidates for the post of Specialist Officer. Interested candidates are requested to send in their BOB SO online Application Form to the official website of the Bank at bankofbaroda.co.in. Presently recruitment is being held for Specialist Officer in Legal, Wealth Management Services – Sales and Wealth Management Services – Operations. All aspiring job seekers who are looking for a Govt Job in the banking sector are requested to check out this amazing opportunity presented by the Bank of Baroda. Banking sector jobs provide a level of job security and lucrative salary options which make them highly contested. Therefore, do not waste time and apply online right away for the BOB So recruitment. The last date for Application is on 26th December 2018. Ensure that you have completed the application process and have paid your application fees before this date in order to make sure that your application is deemed valid. For now, check out this page for all the latest news and updates regarding the Bank of Baroda SO Recruitment. We have provided all the necessary information regarding the Salary, Eligibility criteria and application method for BoB SO 2018. We must inform you that the date of birth mentioned on your matriculation certificate is the date of birth that will be taken into consideration while determining age eligibility. Legal A Bachelor Degree in Law. Graduation (recognized / approved by Govt., Govt. Candidates are required to pay their Specialist Officer Application fee online via the methods described below. The payment methods are enlisted down below after the category wise application fee details. How To Apply Online For BoB SO Recruitment 2018 @ bankofbaroda.co.in? Candidates who wish to secure this splendid chance of getting a job in the Bank of Baroda must follow these steps in order to get through the recruitment application process. So, given below are the various steps to get through this procedure. You can click on the link below to move to the official Apply Online page of IBPS. On this page, you can click on the new registration link. Fill in your application details and register for the BoB So recruitment 2018. You will now gain access to the official Application Form. Fill in the form carefully and submit it with scanned copies of your passport sized photo and signature. You will now be able to pay the application fees which you can do through net banking, credit card or debit card. After paying the fees you will have successfully completed your application process.